Big, colorful and ugly: Graffiti under the Pacific overpass on Sept. 1. 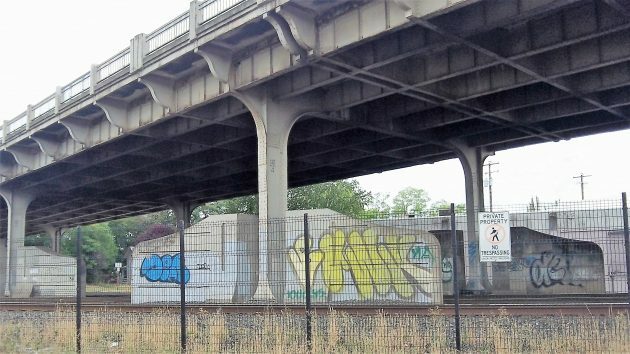 Albany doesn’t have as big a problem with tagging as some other places — yet. But the splashy display that recently showed up under the Pacific Boulevard overpass makes you worry about what’s next. Whoever defaced those concrete barriers — barriers apparently intended to protect the bridge pillars in the event of a derailment — faces a risk of prosecution. It’s not a huge risk, because taggers are hard to catch. But it’s real nevertheless, and Albany police have proved resourceful in going after vandals of this sort. Turns out there’s a state law against “unlawfully applying graffiti.” The law (ORS 164.383) makes it a Class A violation and says a court may punish offenders by imposing a fine plus up to 100 hours of community service. The community service, the law says, must include erasing the graffiti “created” by the offender or someone else. Graffiti vandals presumably do their spraying when nobody is around to watch, probably at night. (How they can see well enough to pull off their intended designs is another question.) But as the 2015 investigation showed, the vandals can no longer count on remaining unobserved. Trail cameras! Outdoor stores advertise these wildlife spying devices. And you’ve probably seen the images — nocturnal creatures doing their thing in the woods when they sense no human beings near. These cameras seem like ideal tools in the fight against taggers. One’s “splashy display” is another’s political ad stunt. Take the tagging at Independence & Hwy 20. Cauthorn is it. Maybe he needs some community service hours. Is it true. Hering calling for additional police involvement in the life of our citizens. There was a time when the “citizens” would take care of this problem without the cops. Apparently Mr. Hering has become something of a Big Government fanboy now that he’s not running a newspaper. Protecting private property is one of the very few legitimate functions of government.